Why do you blog? This is the fundamental question that will guide the content marketing efforts of you and your team. Understanding why you decide to have a writer produce content every week will help you craft content that doesn’t just cause visitors to read, but also choose to sign up for a newsletter or convert. If used correctly, data shows that blogs can propel marketing strategies forward. 77% of users read blogs. B2B marketers who use blogs generate 67% more leads. Blogs are a gateway to success and are a valuable tool for strengthening credibility and trust with customers. However, you need a strategy in place to create blog posts that generate leads. The purpose of your blog should be to get as many eyes on it as possible. This is where inbound marketing comes into play. You have to produce content that is relevant to your readers, and broadcast it in places where they are most likely to see it. First, you have to attract visitors using engaging copy, SEO, and social media platforms (which could include paid ads). Much of this starts with your company website. Next, your website and social media accounts can be two of the primary tools to bring visitors to your blog. Through advertising new posts on Twitter, Facebook, or Instagram, or putting your latest posting on your homepage, visitors can easily navigate to your blog. 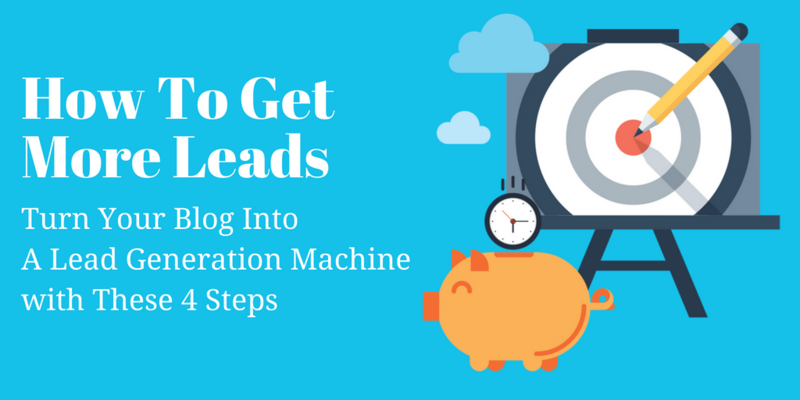 Finally, you can gain on these inbound marketing efforts by nurturing your leads. This step includes targeted email campaigns that include relevant blog posts, CRM tracking, and potentially multiple phone conversations. Following the promotion of your webpage and social media accounts, your blog can be the next pivotal step in your inbound marketing strategy to intentionally attract and get to know your audience. The first section highlights how blogs fit into your holistic marketing strategy. Now, you need to understand which topics will garner the most attention with your audience. Research news or current events in your industry, and take note of any common themes. Is there a common problem that keeps arising that needs to be addressed? Can you give tips or advice to help your audience better solve these problems? Take note of the themes, and see how your company is addressing them. Take a look at the common keywords coupled with your industry, and see how they fair using an SEO-friendly tool like Google Trends or programs from Moz.com. This can help you choose topics that your consumers are continuously searching for. Don’t be afraid to look at competitors. It is never encouraged for you to copy another organization’s blog content. However, it does not hurt to take a look at what competitors are doing to know if you are on the right track. If they are addressing topics relevant to your audience, you would want to hit similar if not the same topics. It never hurts to go to the source. If you already have an email list or have a good following on social media send out a survey asking for their input. Their answers will help you deliver content that you are confident they need. Resources - These provide references that visitors can walk away with: a list of helpful websites, a spreadsheet, eBook, or webinar. Tips – These are typically numbered articles that provide advice regarding a specific topic. Narratives – Narrative posts are great for engaging readers through storytelling. This could be a story about the company, an employee, or a customer that centers around the product or service. Case Studies/White Papers – If you want to show how the company is helping customers or how you or your leadership has positioned the organization through thought leadership, these are an excellent way to convey this. Once you figure out the content your audience wants to see it is easier to craft a blog strategy that will broadcast the best content. You have discovered your topics, and now it is time to structure your blog post to generate the most engagement. 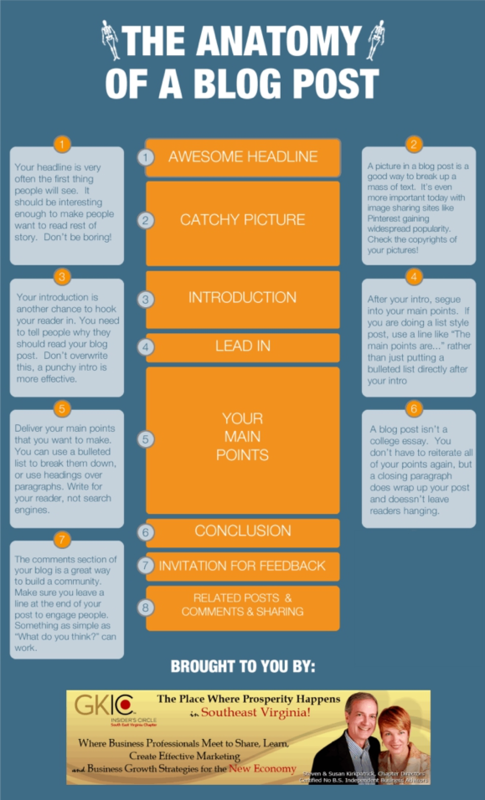 As Neil Patel says, you have to understand the successful “anatomy” of a blog post. A thought-provoking and engaging headline. A captivating photo that conveys the topic of the blog. An introduction that is brief, concise, and an effective lead-in to the main points that define the problem. A lead-in phrase to connect the introduction to the main points. Main points that can be written as bullet points or as headings. These should be spaced to improve readability and should address the problem stated in the introduction. A conclusion that wraps up your ideas and includes a call to action for readers. Tip: It is also a good idea to invite readers to provide feedback through email or by contributing to the comment section. This step keeps the engagement and conversation going. Even though we would like to believe that visitors to your blog will read every word, this is likely not going to be the case. Therefore, the above structure (with generous use of headings) makes it easier for your readers to skim the posting and still pick up the main idea. At the end of the day, your blog has to be digestible. Readers should feel they can quickly consume the material. An excellent way to do this is to ensure the content itself is readable. First, paragraphs should be short and no more than seven sentences. Breaking up lengthy prose will prevent readers from being overwhelmed as they read. Keep sentences to no more than 20 words. Sentences should also be concise, just like paragraphs. Watch your wording. Try to limit the number of difficult words, and eliminate any jargon. Also, include transition words —like “because,” “therefore,” and “most important,” —when possible to help readers move from one topic to the next. Don’t overuse words. It is easy to include the same word multiple times in your post. Write for your audience. Make ideas as simple as possible to understand and digest. As stated in a stat above, readers trust blog posts to provide accurate information. It gives companies the opportunity to step out of “selling,” and step into the role of providing useful data or news. "Blogs are crucial to creating trust with customers." Therefore, their use should be on every company’s list. Blogs should encourage customers to take another look at what you do, and why you do it. Through providing insight topics that matter to creating engaging and readable text, blogs can turn a visitor into a lead.